← You’re a Nice Place to Visit, but Would You Want to Live There? For her, the phrase is a metaphor for being assertive and embracing risk in order to achieve the greatest level of success in the workplace. But as a teacher of the Alexander Technique, I’m particularly interested in the physical aspects of leaning in – or it’s opposite, leaning back. 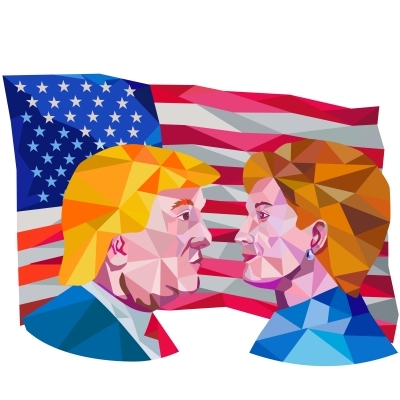 Especially today when America – and the world – will witness the first Presidential Debate in which Hillary Clinton and Donald Trump go face to face on the same stage. Both candidates’ non-verbal communication patterns will be on view for all to see, including their leaning propensities. Non-verbal patterns have been shown to be at least as important as words in influencing audiences, so the way the 100 million expected viewers react to what they see may well decide the outcome of the election. It will come as no surprise that Trump is a big-time leaner-in. At times so much that it has an element of aggressiveness. Clinton doesn’t lean a lot, but when she does, it’s my impression that she leans back a bit – as if she wants to get away from her audience. And that could explain some of her perceived failure to connect on a personal level. I’ll be glued to my TV this evening – 9PM Eastern time, 6PM Pacific time. You might want record it in order to take a closer look at the candidate’s leaning patterns and I’d love it if you post what you see, either below or on Facebook. Very interesting, Robert and Imogen. I clearly recall this issue of body language (or non verbal patterns) being discussed with Cathy Madden when she came to visit the Bristol Alexander School when I was training there. It was pointed out that I was often “in the space” of the people I was talking with, even though I could have been on the other side of the room, and I set about becoming aware of it and consciously leaning back in order to stop the habit. Of course, basic inhibition would have been more useful. For me, that was a cultural thing that I had been brought up with, and I still notice it particularly in a room full of military colleagues, as the people lean in towards each other, (possibly to make sure they can be heard, or to emphasise a point they may be making). It had not occurred to me before that a habit of leaning back, even a bit, would give the impression of trying to escape! I must read that book.